1. Preheat oven to 170 degrees. 2. Heat the oil in a large frying pan, and brown off the the shanks evenly. 3. Transfer the shanks to a large casserole or ovenproof dish with a lid. Add the stock, barley, and thyme. Cover with foil and place the lid on. Cook in the oven for approx. 2 hours. 4. Remove from the oven and add all the vegetables, plus some more water or stock if required. Season to taste, recover, and put back in the oven for another hour. 5. Take the casserole out of the oven and check that the lamb is soft and falling off the bone. If not, return to the oven for another 15-30 mins. 6. Take the lamb out of the casserole dish and place on a warm plate and cover tightly with foil. On the top of the oven, reheat the vegetables over a low to medium heat and check that they are cooked to your liking. Add more water or stock according to how you like the gravy. 7. Serve on warm plates, a couple of spoonfuls of the sauce on the bottom. Place the shanks on top, and then some more of the sauce and vegetables. 8. If required, serve with some baby potatoes or mashed potatoes sprinkled with a little mint. Irish style merely means adding pearl barley as in Irish Stew, very popular on St Patricks Day! This truly is a warming and delicious dish, with a couple of twists in our tips! CAN BE SLOW COOKED as well. If you want to slow cook this, still brown off the shanks and put into a slow cooker with all the vegetables and stock. Cook on high for 4 hours, and then test. Replenish stock if necessary or even use water. Stir a little and continue to cook for another hour. Repeat this process until the lamb and vegetables are all tender. Add some chopped mint at the end before serving. A dash of mint sauce into the gravy will really bring out the flavour of the whole dish ” bit of a cheat but delicious! Roasted parsnips are also delicious served with this casserole, if you have the time. Heat the oil in a large frying pan, and brown off the the shanks evenly. Transfer the shanks to a large casserole or ovenproof dish with a lid. Add the stock, barley, and thyme. Cover with foil and place the lid on. Cook in the oven for approx. 2 hours. Remove from the oven and add all the vegetables, plus some more water or stock if required. Season to taste, recover, and put back in the oven for another hour. 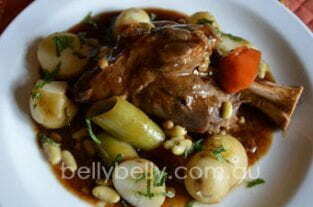 Take the casserole out of the oven and check that the lamb is soft and falling off the bone. If not, return to the oven for another 15-30 mins. Take the lamb out of the casserole dish and place on a warm plate and cover tightly with foil. On the top of the oven, reheat the vegetables over a low to medium heat and check that they are cooked to your liking. Add more water or stock according to how you like the gravy. Serve on warm plates, a couple of spoonfuls of the sauce on the bottom. Place the shanks on top, and then some more of the sauce and vegetables. If required, serve with some baby potatoes or mashed potatoes sprinkled with a little mint.